In the churning, smoldering world of heavy metal, it’s the middle frequencies that make all the difference between mush and muscle. With the UM300 ULTRA METAL, you not only get control over the Mids – you can micromanage them! 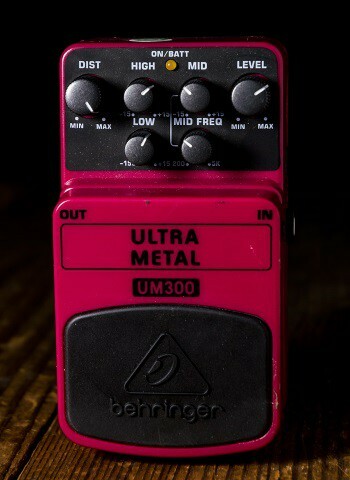 The UM300 effects pedal gives you the most extreme, sought-after hard rock and heavy metal sounds, with super-thick, tube-like distortion – plus virtually endless sustain. Like most distortion boxes, the UM300 comes with Distortion and Level controls, and the High and Low controls let you dial in the amount of top-end and bottom you desire – but the similarity to other stomps ends right there. Much like our world-class mixing consoles, we’ve given the UM300 a Mid Frequency control, allowing you to select a midrange frequency (from 200 Hz - 5 kHz) and boost/cut it by up to 15 dB. What this means in terms of tone, is thick, tube-like distortion with endless sustain for everything from aggressive, traditional metal assaults – to the ultimate in modern crunch! A brilliant status LED tells you when the UM300 is active, while a top-quality on/off switch maintains highest signal integrity in bypass mode. You can power the UM300 with our PSU-SB DC power supply (not included), or pop in a 9 V battery. Is there a hole in the middle of your tone? You’ll be surprised how affordably and efficiently the ULTRA METAL UM300 can fill it! Take off with the most extreme and sought-after hard rock or heavy metal distortion – at your BEHRINGER dealer today, or order online.